The Kennebunks are located on the southern coast of Maine and are rich in tradition and history. Comprised of Kennebunk, Kennebunkport, and Arundel, this area has long been known as a popular attraction for tourists and summer residents. 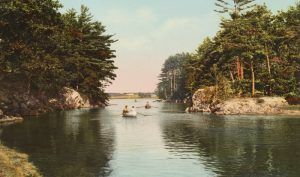 To the Abenaki Indians, Kennebunk meant “the long cut bank,” believed to be in reference to Great Hill that drops sharply to edges at the mouth of the Mousam River. Other Native Americans also lived in this area including the Penobscot, Passamaquoddy, Mi’kmaq, Kennebec, Pequawket, and Maliseet tribes. These people followed a pattern of seasonal migration, living near the coast during the warmer months of the year and moved inland during the colder months. 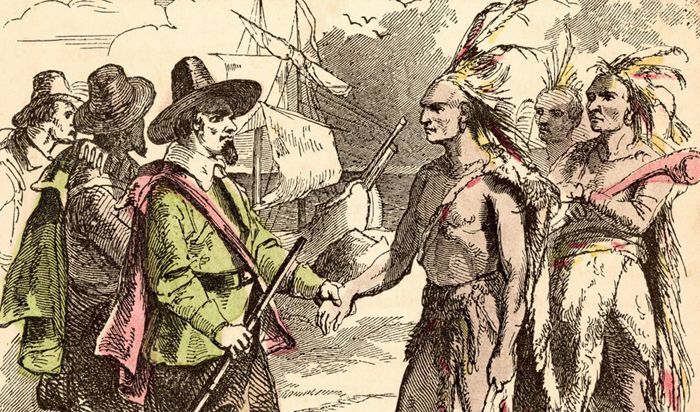 The first European explorer to travel in the area was Bartholomew Gosnold, who sailed from Falmouth, England and reached what is now Kennebunkport in the spring of 1602. In 1604, French explorer Samuel de Champlain visited the islands defining Cape Porpoise harbor, naming it “Le Port aux Isles,” meaning Island Harbor. In 1614, famed Captain John Smith, the English adventurer of Jamestown, Virginia explored the Maine coast. He named Cape Porpoise for a school of porpoises he saw there. When he published Descriptions of New England in 1616, his writing attracted numerous fishing parties to the region. Kennebunk was first settled in 1621 as a trading center, but in its early years was a part of the town of Wells. The area was formally claimed by England in 1622 and soon a number of settlers were living along the coast, and along the Kennebunk and Mousam Rivers. The first settlement was in the Cape Porpoise area and dozens of fishing vessels were working the waters along the Maine coast. Other early settlers were harvesting the abundant timber, building sawmills along the rivers, and farming. By the 1640s, coastal and inland land grants were being parceled out which were commonly referred to as “the Kennebunk Grants.” In the 1650s, the nearby Massachusetts Bay Colony asserted territorial claims over what is now southern Maine and promptly ordered the new Maine townspeople to build roads, schools, organize a militia, and pay taxes. 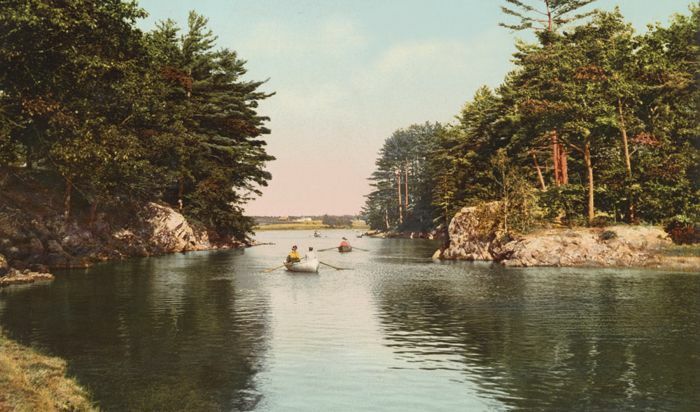 In July 1653, Kennebunkport was incorporated as Cape Porpoise under the government of the Massachusetts Bay Colony. After years of coexistence with the Native Americans, dissension arose in 1675 with King Philip’s War and a number of conflicts would occur over the next several decades. In 1675 the Wabanaki Confederacy began to raid English settlements along the New England/Acadia border in Maine in an effort to stop the tide of English expansion. 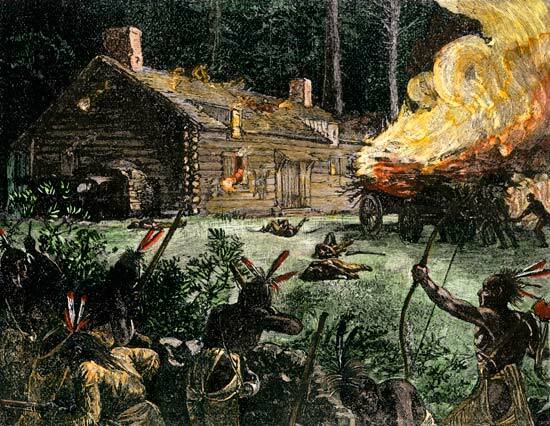 A massive attack was made on Fort Loyal in nearby Portland in 1690 by Abenaki Indians and their French allies, resulting in everyone being killed or kidnapped. The attacks continued in the area as the French and Indians killed and captured colonists and burned many farms. At this time, the people of Cape Porpoise retreated to a harbor fort on Stage Island where they were rescued by vessels from Portsmouth, New Hampshire. The several hundred inhabitants of Kennebunk fled to the Storer Garrison in Wells, some five miles to the southwest. While the residents were safe inside the garrison, 500 Indians and their French allies attacked the area, destroying miles of houses, mills, and livestock. Afterward, many of the settlers fled, and Cape Porpoise was entirely abandoned. In 1718, descendants and new settlers petitioned the Massachusetts legislature to re-establish a small fishing community in the area, and the town of Arundel (at Kennebunkport) was incorporated in 1719. In 1821 the town was renamed again, this time to Kennebunkport. However, sporadic Indian attacks continued and the last raid on the Kennebunks occurred in 1726, when the Baxter and Durrell families were invaded while the men were away. After looting the homes for possessions, they burned the houses and took Mrs. Durrell and her four children captive. However, when the Indians were fleeing and the family slowed them down, they killed their captives. During the Indian Wars, settlement slowed considerably, but it never stopped. The mills along the waterways were rebuilt. 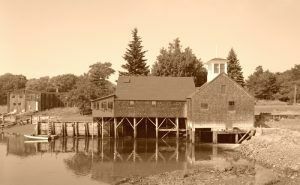 In 1724, Captain Thomas Perkins, Jr. built his house in Kennebunk and built a gristmill along the river in 1751. The mill operated for nearly 200 years until 1939 and was listed on the National Register of Historic Places in 1873. Unfortunately, the historic mill was destroyed by an arsonist in 1994. In the meantime, the harvesting of the abundant local timber gave rise to the shipbuilding industry. Shipyards were first established on the Mousam River as early as 1730 but due to the difficulty of navigating the circuitous, barred mouth of the Mousam River, the trade was relocated to the Kennebunk River by 1755, with the vessels being built at Kennebunk Landing. From 1790-1867, hundreds of ships were built at the half-dozen major shipbuilding yards. Shipbuilding continued in Kennebunk until 1918. Today, many of the landmarks throughout the Kennebunks remain as a tribute to the prosperity of the maritime industry.